WXYZ Detroit has a helicopter circling highway I-94 near Dearborn, Michigan right now and it's streaming live video of the most hellacious conflagration I've ever seen. 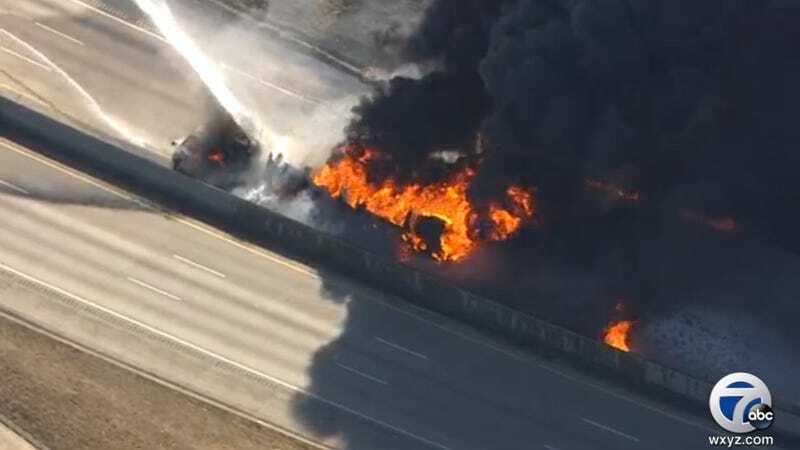 A tanker truck reportedly hit a car and exploded at around 11:00AM EST, taking several smaller vehicles with it. Check out the feed right here. Update 11:43 AM EST Local fire departments are attacking the blaze with an aerial hose and ground hose. Contents of the burning truck have not yet been identified. Update 11:44 AM EST A second aerial ladder has been raised to attack the fire. Witnesses are describing the noise of explosions "lasting something like thirty seconds" and feeling buildings shake from blocks away. Smoke can be seen from downtown Detroit. Update 11:50 AM EST Looks like the truck hit a passenger car before coming to a stop. You can just barely see it in this image. Michigan Department of Transportation officials anticipate damage to the structural integrity of the highway. Update Noon EST Another witness says he heard "six explosions" from about a half mile away, felt his building shake, and saw smoke block out the sun. The road surface is currently burning, and vehicles equipped with firefighting foam (to extinguish fuel fires) have been dispatched from the airport. Update 12:39 PM EST Detroit Fire Chief Joe Murray says no serious injuries for anybody involved, though one was transported to the hospital for a checkup. Truck was carrying gasoline and diesel. No evacuation of the nearby area was required, but some gasoline did get into the sewer system which explains the flames spotted coming from nearby manholes. Update 1:42 PM EST The blaze has been extinguished but the road will remain closed as investigators and transportation officials evaluate the incident.